Why Do I Get Muscle Spasms and How Can I Prevent Them? You’re sleeping soundly when all of a sudden you start dreaming that your leg is being sawed off. Or that someone very large is stepping on your foot. Or that several piranhas are feasting on your calf. You wake up with a gasp and realize that you are experiencing a very real, very painful cramp in your leg or foot. The muscles are tense, rock hard, and you have no idea what to do. This is one of the worst ways to wake up. These ugly cramps are usually short-lived and seem to come out of nowhere. Ever wonder what they are, what causes them, and how in the heck to stop (and prevent!) them? 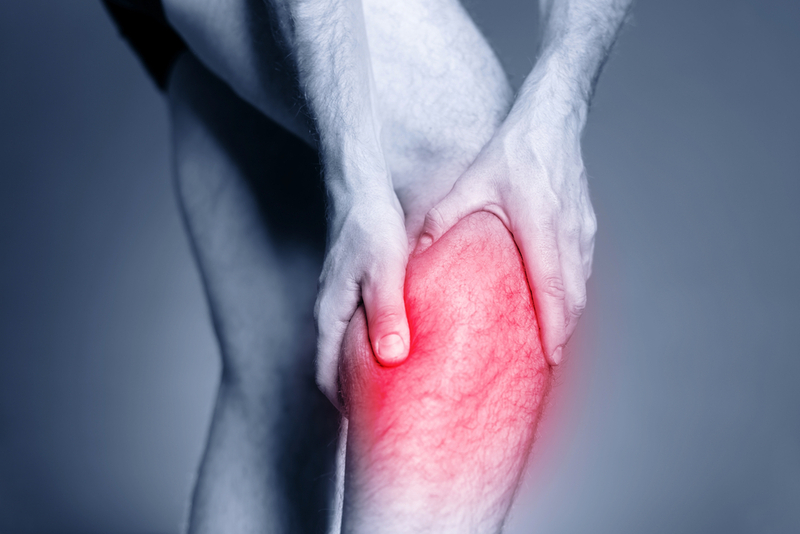 Muscle cramps are caused by muscle spasms or an involuntary tightening of the muscles. Besides the leg and foot, common body parts to be affected by muscle spasms are the arms, hands, stomach, back, and the rib cage area. A commonly-honored home remedy for someone suffering from muscle cramps is to load up on bananas, as it is widely believed that muscle spasms are caused by a lack of potassium. There is some merit to this belief, but there are many more possible causes for muscle spasms or cramps, such as dehydration, muscle overuse, insufficient stretching before or after activity, calcium or magnesium deficiency, or poor blood circulation. There are even a handful of medications that can increase one’s risk for muscle spasms. The greatest tip for dealing with painful muscle spasms is to prevent their attacks in the first place. Here’s a hint: pre and post-activity stretching isn’t just for athletes, you weekend warrior. Your muscles always need to be primed and prepared for the activities they’re being asked to do. Sunny Saturday chores like pulling weeds, mowing the lawn, raking up the last dead leaves of winter and home maintenance/repair tasks all have the potential to cause your muscles to seize up, leaving you gasping and near tears in its wake. Also, even if you don’t necessarily feel thirsty, drink up! If your muscles are working, they demand a proper balance of sodium, electrolytes and potassium. If muscles are dehydrated, they’re also being depleted of these essential nutrients. If you have already been experiencing muscle spasms and cramps, some communication, and sessions with your massage therapist might be the needed steps to bring relief. While your muscles might feel too painful while cramped to be touched (although some light strokes will eventually bring relief mid-cramp), receiving a massage before or after muscle spasms can bring preventative or healing relief. Massage increases circulation and relaxes muscles, decreasing the chance for frequent cramping. Muscle spasms are often the result of overuse, where the muscle fibers “knot up” to help and protect a strained, injured area. As a therapist smooths, lengthens and breaks up the knots, you’ll be less likely to continue to injure that area, leading to fewer spasms. Taking a few easy steps to properly care for your body before and after exertion can lead to happier muscles, and more peaceful nights of sleep. Barring any unsightly illnesses on Taco Tuesday, of course.